What is the state of digitization in the healthcare sector? 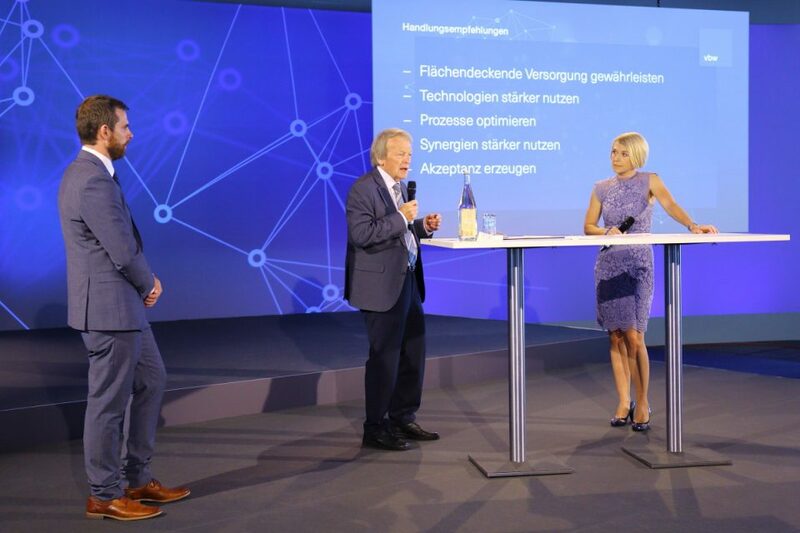 Which technological developments are trend-setting and which key technologies need to be improved?These and other questions were the focus of the Congress of the Zukunftsrat of the Bavarian Economy, which took place on 16 July 2018 in Munich. The MIRO Innovation Lab which is hosted by the DLR Institute of Robotics and Mechatronics presented its current research work in the area of assistive robotics at the exhibition area. The technological key element is the robotic arm DLR MIRO, which was specifically developed for the use in the operating room. Its structure, size and flexibility are based on the human arm, to allow intuitive, sensitive and safe operation. During surgery, the surgeon can use one or more MIRO robots flexibly and modularly with different instruments. Thus, the system is versatile, e.g. for guiding a laser unit for exact bone cutting, in robot-assisted endoscope tracking and in minimally invasive surgery. Current concepts show how the training of surgeons – especially in minimally invasive surgery – can be carried out more efficiently by using specific haptic guidance. A study on healthcare and medicine prepared by Prognos AG was presented to the more than 400 participants and 48 exhibitors. This study points out current trends and challenges in the healthcare sector and how new technologies can help to address these challenges. Professor Gerd Hirzinger, former director of the Institute of Robotics and Mechatronics, and Julian Klodmann of the MIRO Innovation Lab emphasized on stage how important it is to implement research results into practical applications more quickly and presented possibilities of cooperating within the MIRO Innovation Lab. This special cooperation platform with a focus on robot-based medicine enables close collaboration between research, clinical partners and industry. Subsequently, based on the results of the study, the Zukunftsrat issued recommendations to politics, industry, science and society with the aim of not only generating added value through innovative products, business models and processes, but also preparing the health care location for future challenges. The complete set of recommendations can be downloaded from the homepage of the vbw Zukunftsrat.